Squire Technologies a proven developer of VoIP and SS7 solutions to the telecoms industry announces its globally deployed Class 4 softswitch and software only Media Gateway Controller will be offered on Pay As You Go. This extension offered to new ISPs and telecoms service providers opens up a software only route to market for adding VoIP and SS7 services to their existing networks, without the capital expenditure. With both carrier grade products having extensive use globally and a proven pedigree of service, the SVI Class 4 Softswitch and SVI Media Gateway Controller are now available to a wider selection of providers through the easy Pay As You Go payment structure. Often the initial raising of capital is essential to projects moving forward and the driving demands of lower cost calls and five nines service means investment choices are put off for the longer term. 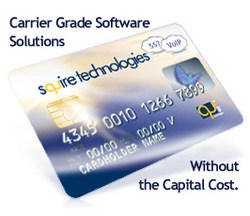 Now with the flexibility of payment and the assurance of service from the Squire Technologies' VoIP Softswitch and Media Gateway Controller providers can deploy carrier grade software, maximizing their investment with regular payments over a specific term. Simon Dinnage, Business Development Director - Squire Technologies, "This extension offered to new ISPs and telecoms service providers opens up a software only route to market for adding VoIP and SS7 services to their existing networks, without the capital expenditure." As a software deployment, the cost effective SVI_MGC SS7 Media Gateway Controller enables SS7 on leading VoIP Media Gateways using industry based standards - MGCP, MEGACO H.248, SIGTRAN, SIP, SIP-I, SIP-T & H.323, thus enabling SS7 on Cisco PGW, AS & MGX series gateways; Alcatel Lucent Max/TNT and APX gateways; Audiocodes Mediant and Orca Series gateways. SVI_MGC Media Gateway Controller therefore enables clients to interface their VoIP networks to SS7/PSTN based telephone networks allowing the rapid launch of VoIP services with all the benefits of adding value for the end user. The SVI_C4 wholesale Softswitch provides typically SIP trunk providers, carriers or enterprise markets a high performance, scalable Class 4 SoftSwitch enabling the delivery of secure, reliable VoIP traffic and services over multiple IP networks. Capable of integrating voice and data, this highly customizable VoIP routing engine can be deployed with a range of add-ons providing SIP Registration, Network Monitoring via SNMP, RTP proxy and Wholesale Billing. Coupled with a dedicated installation and support team, Squire Technologies can provide a complete, SS7 VoIP end-to-end service with support from pre-sales, consultancy, to installation, to ongoing post-sales support & product development. For more information on Class 4 Softswitch and Media Gateway Controller on 'Pay As You Go' contact the SS7 VoIP experts.